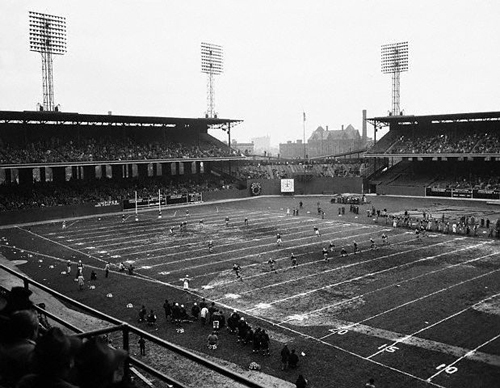 The Cardinals' place in NFL history was established this fateful Friday in Canton, Ohio, at the new league's second organizational meeting. It was here that the franchise known as the "Racine-Chicago Cardinals" was admitted to the American Professional Football Association (APFA), later to become the NFL. However, this team's story had begun much earlier - many years before that of the NFL or any other professional football team still in existence. Back in 1898, a painting and decorating contractor named Chris O'Brien organized a neighborhood football team on Chicago's south-side. At first, they played under the name Morgan Athletic Club, but later changed it to the Racine Normals; this new name included both the street (Racine Avenue & Normal Boulevard ) and the field (Normal Park) names on which they played. In 1901, O'Brien received a good deal on used jerseys from the Maroons of the University of Chicago. However, upon seeing the faded red jerseys, he exclaimed: "That's not maroon, it's cardinal red!" And so, the team was given a new nickname - one that they would still be using almost a century later and 1,500 miles away: "Cardinals." Playing against local, mostly amateur competition, the Cardinals managed to remain in operation for several years. By 1906, competition was so scarce that the team disbanded, but seven years later, O'Brien reorganized the Cardinals and the team's popularity steadily grew. New uniforms as well as a new head coach, Marston Smith, were introduced for the 1917 season as the Cardinals went on to become the champions of the Chicago Football League. World War I and the influenza epidemic forced the Cardinals to suspend operations for part of the 1918 season, but soon the team was reorganized once again by O'Brien. Finally, on September 17, 1920, the Cardinals joined the newly formed APFA for a franchise "fee" of $100, although it is believed that none of the charter members ever paid it.